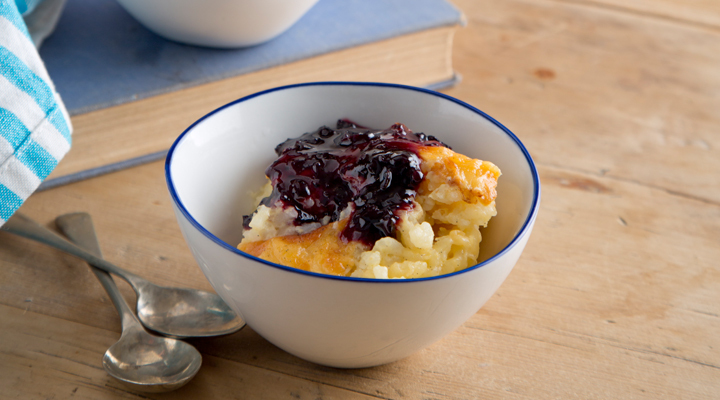 Warm and comforting, rice pudding is one of the simplest puddings and served with jam sauce is also one of the most delicious. Put the milk, cream, sugar and split vanilla pod into a saucepan. Bring to the boil, then turn off the heat. Set aside for 15 to 30 minutes to infuse. Meanwhile, preheat the oven to 180°C/gas mark 4. Grease a 1 litre ovenproof pudding dish generously with butter. Put the rice in the greased baking dish and strain the milk through a fine-mesh sieve over the top. You can wash and dry the vanilla pod and save it for another use. Stir to combine, then grate a pinch of nutmeg over the top. Bake in the oven for 1½ hours, until the rice pudding has thickened and the top is golden brown. Meanwhile, to make the sauce, put the jam in a saucepan with the water and warm over a low heat, whisking to blend. Cook for 5 minutes and serve warm doppoed on top of the rice pudding.